Review: Sometimes one forgets how long this band has been around for and how long they've been making seminal pieces of music which still sound so contemporary in 2014. 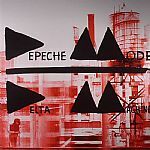 This being Depeche Mode's fourth studio LP, and bang in the middle of the synthpop uprising, the album is just incomparable to the rest of the chart-based synthpop that was prevalent at the time. It's subtle, musical and deeply experimental, of course. One of our favourites from the band. Review: Recent reviews of Spirit, Depeche Mode's first studio set for four years, have remarked at how angry and frustrated the band seems to be throughout. Messers Gore, Gahan and Fletcher are not particularly happy with the way the world is right now, and have laid down an album of rare intensity, seemingly fuelled by a growing desperation at political events on both sides of the Atlantic. Producer James Ford undoubtedly played a role in defining the sound of Sprit, but the combination of raucous, punk style guitars, thrusting electronics and big choruses is what we've come to expect from Depeche Mode.